Magnetic media like cassette and consumer VHS tapes last 10-30 years. Videotapes can even begin to fade after only one play! Don’t wait until it’s too late! Transfer your tapes now! DVDs are read by laser so there is no wear and tear from play since nothing touches the disc! All straight VHS transfer projects are logged and converted to DVD format in real time. 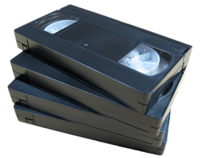 We give you the option of a straight to DVD transfer, or we can edit your tapes by request. DVDs are expected to have a longevity of anywhere from 20 to 300 years depending on the materials and dye formulations used to make them. Discs with inkjet printable surfaces, for example, will not last as long as DVD discs with surfaces that use the thermal transfer “silk screen” printing process, such as the discs that Encore DVD Productions use!